DONT SPEND 50-70 DOLLARS ON THE SAME MESH THAT I SELL!! 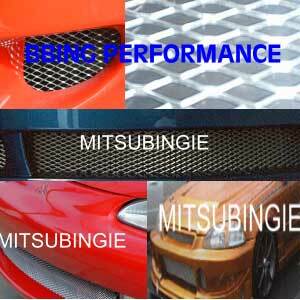 This Mesh Grill will give your car a custom look for a low price!!! If you are ready to give a custom look to your car, and are tired of having a big hole in your front spoiler that is just asking for rocks to damage your radiator, then bid on this and improve your car's look!!!!! Not only does this mesh look great, but it will protect you car from sticks, bugs and stones. E-mail me with any questions, or you buy the item direct!! MITSUBINGIE@AOL.COM. I answer 3 times a day!!! Check my feedback and bid with confidence!! MEASUREMENTS: Two (2) 3 feet by 6 inch pieces of sturdy aluminum diamond shaped mesh!!! That's 6 feet!! INSTRUCTIONS: I offer instructions for two methods of installation. You can do it the way that professional racers do, or use the simple ties that I provide (tie downs that will hold the grill in place, but can be just easily removed as installed). OPTIONS: You may choose the option of getting the grill primed and painted, or clear coated for only 5 dollars more. I have many colors including red, blue, green, black, white, chrome, and yellow!!! Any color!!! I accept payments through Pay Pal and money orders. (Money orders are sent at your own risk and must include item number.) Shipping and handling is an additional $9.85 ($6.85 shipping, $3.00 handling, packaging and processing). Send money order to: Byron Louie 7328 Rush River Dr. Sacramento,CA 95831. Payment must be received within 7 days and I must be contacted within 3 days. Positive feedback will be given to honest bidders and negative feedback is given to dead beats. Thank you!! SHIPPING: Fast shipping!!!! Priority mail 2-3 days!!! Praise : A+++++++, super fast shipping, very cooperative, smooth, will do business again! Praise : Fast payment, Great communication. Thanks for a smooth transaction! !